Every vehicle has a story. Do you know the details of yours? 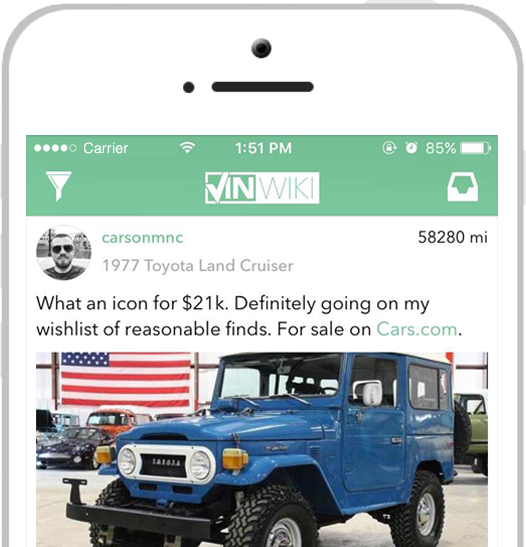 VINwiki lets you see the full picture behind a car’s unique history. Did a bear tear off the bumper? Has your BMW M5 been used to pull a boat? What really happened where it says “Accident Reported”. Only VINwiki allows you to see the vital information about the life of a vehicle. Are you interested in a specific vehicle? Look it up on VINwiki. You never know what you may be able to find out about the vehicle’s history and its story. If it’s not on there, go ahead and add it! Tell others where you saw it and why you are interested. Track your car’s story by adding photos, dates, mileage, service records and more to your vehicle timeline. A complete VINwiki Vehicle Profile is attractive to people interested in taking the car on the next leg of its journey. Check out some of the amazing stories from some of our users!